Recorded Live at Shibuya Kohkaido, Tokyo, Japan - October 08 & 09, 1998. Files: 40. :: Size: 731.96 MB (mp3) | 1.56 GB (flac). Personnel: Jon Anderson :: Steve Howe :: Billy Sherwood :: Chris Squire :: Alan White :: Igor Khoroshev. 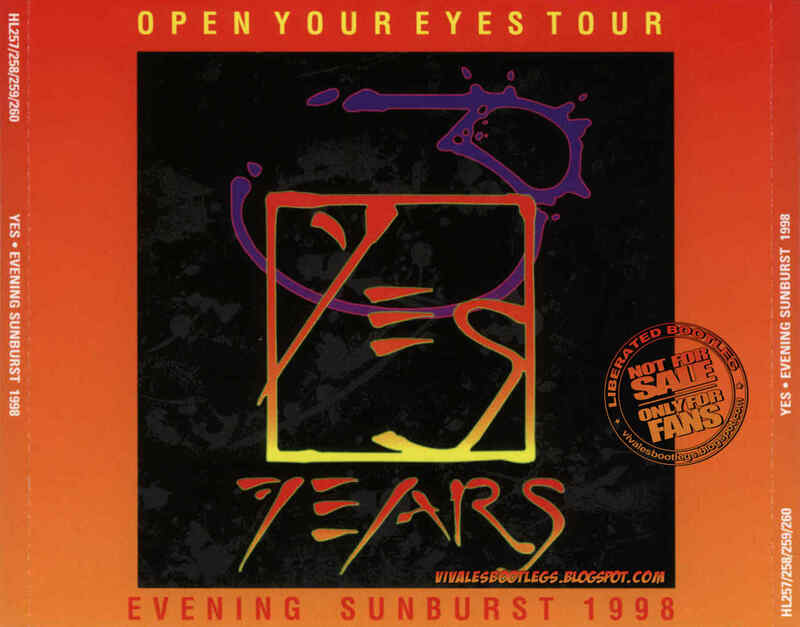 Notes: When Yes released Open Your Eyes in November 1997 they toured for almost a solid year with very little breaks between the various legs. The final five dates were in Japan opening with two, on October 8th and October 9th, in Tokyo. These were Yes’ first gigs in Japan since the end of the Talk tour four years before and the first time they played the Shibuya Kohkaido since 1973. 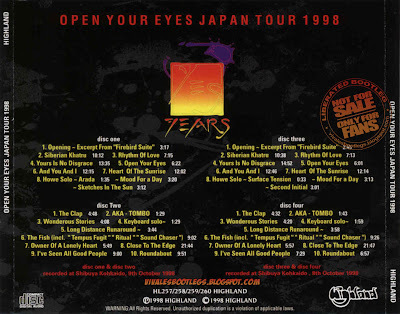 When the tour began on October 17th, 1997 in Hartford, Connecticut the setlist was very ambitious with the expected hits including two from the Trevor Rabin era, solo sections for all the members, “The Revealing Science Of God,” three songs from the new album and even “Children Of Light” from Keys To Ascension II. “No Way We Can Lose” was dropped after the first night (and played only one more time the following July), and by the time they came to Japan both “From The Balcony” and “Children Of Light” disappeared. 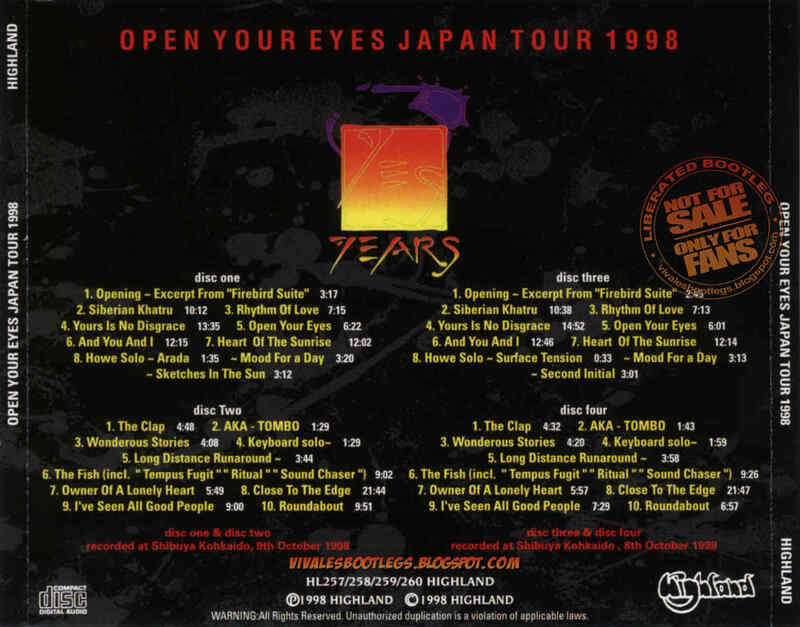 The sets they played in Japan aren’t exactly stripped back (the two Tokyo shows are both over two hours long), but it seems they lost faith in the newer material after the album failed to sell and the show reverted into a greatest hits revue. It is a shame they didn’t work the new songs more since, despite the critics, there were many good ideas which could have taken new life on stage. Regardless, after these five shows Yes would meet up again in Vancouver to work on the brilliant The Ladder album and tour. Evening Sunburst 1998 on Highland collects two excellent quality DAT recordings from the opening night. This is one of several releases from this tour and one of the better ones in terms of sound quality, performance, and relevance.